We have four two channel versions of the Marshall 18 watt amps that you might want to consider – the sIII, Plexi, TMB and the v6. All 18 watt amps incorporate Treble, Midrange, Bass, Gain [volume] and Volume [master volume]. The second channel (Normal Channel) has Tone and Volume controls. The sIII is a medium gain amp and is voiced to do the early plexi/JTM45 sound very nicely. The range of tone is from spanky clean to Marshall grind. You can get a great Clapton Bluesbreaker sound and Hendrix as well. This amp can handle Blues-Rock, Country & Reggae. The Second channel (Normal Channel) is same configuration as the Tremolo channel from the original 18 watt design but without Tremolo. I have built and played 18 watters before and they are always lacking in something, but yours keeps up with my 50 and 100 watters in feel, clarity, etc. So thank you!! I am very very pleased. The Plexi is voiced to sound period correct for a Marshall Plexi Lead. Screaming guitar lead tones at a much lower volume. The amp can thump and grind with less compressed tone than the other 18 watt variants. The Second Channel (Normal Channel) provides way more overdrive than most 18 watt normal channels while the Plexi channel is capable of the best clean sound we have ever heard come out of an 18 watter. With a pair of greenbacks, you’ll be shocked how period correct it sounds. Crank up the gain and you are in crunch tone heaven. The clean boost just adds another dimension, it nails all those old AC-DC tones dead on and has way more gain on tap if needed. Is based on the Plexi Super Lead preamp design with selected ‘brown’ components. This gets you very close to Eddie van Halen sound. Hot licks but with a very surprising clean tone with gain turned down. This baby can really move some air! Crank up the normal channel and it really gives up the goods! Lots of crunchy to high gain AC/DC tones for days. The TMB side cranked up is great going from clean to mean. Leave the gain low and crank the master and there is quite a lot of headroom with big fat cleans. The fat switch fattens up the TMB side and makes it a bit fuller spectrum of sound. Clip here. The TMB amp is a high gain amp that does the 80s sound very nicely. It is intended for musicians who want plenty of grind. It does ZZTop very nicely. It is both responsive and aggressive. The second channel is the Normal channel from the original 18 watt design. This amp does classic rock crunch to metal. The v6 adds switchable output tubes (EL84 / 6V6) and boost to the sIII, Plexi or TMB. The sound is close to a Fender Deluxe and an 18 watt grafted together. At low volume levels the difference isn’t that noticeable between to channels but once you get into loud clean tones and beyond (crunch and full on distortion) you really notice the difference. The EL84s have more highs so the bite and crunch is more apparent with them. Overall, they are a bit clearer than the 6V6 and the EL84 defiantly have the chime thing going on. The 6V6s don’t have as much treble but are smoother overall with more bass. When you turn the amp up, link the channels and use 6V6s the tone is really nice. Smooth, good compression but still plenty of clarity. The inputs can be jumped on all of our amps. If you want to hear some clips of these fabulous amps, go to 18 WATT CLIPS or check out the Clippage section of our forum. What differentiates our kits from others is part quality, fit, documentation and support. Included are all components; Mallory 150M caps; CARBON COMPOSITION resistors; CLIFF jacks, ALPHA pots, JJ 32/32uf filter cap; Belton Micalex tube sockets; tube retainers & shields; 1/8″ thick GP03 Turret Board with large size KEYSTONE Turrets; CARLING switches; 6A impedance switch; All 22 gauge hook-up Wire; Pre-twisted heater wire; BELDEN Co-Ax cable; All Mounting hardware, spacers and nuts; Hand-Made Plexi Gold Front faceplate with 4 Inputs; MARSHALL control knobs; Pre-Cut 0.09″ Aircraft Aluminum Chassis with tapped holes for mounting screws and silk screened rear chassis; 100 Page Assembly guide; large 11″ X 17″ size layout and schematic drawings and REAL Support. The recommended but optional transformers are custom made by Heyboer to the exact specifications of the original Radio Spares set used in the early Marshall 18 watt amps. The output transformer has convenient flying leads, multiple secondary windings and the unused ultralinear taps on the primary side has been wound to 5K. This is an excellent 18 watt transformer. The vintage looking, small box Plexi-style sized chassis is based on standard dimensions that fit most commercially available cabinets including Trinity Amps. Find more details at Trinity 18 Watt Forum Link. I have finally had enough down time off the road, to start and finish building my 18watt Plexi with dual power tubes. It is up and running and sounds fantastic!! You really took your time crafting this thing and I just wanted to say thank you for taking the time to do so and sharing it with everyone. I have built and played 18 watters before and they are always lacking in something, but yours keeps up with my 50 and 100 watters in feel, clarity, etc. So thank you!! I am very, very pleased. I have built various kits from Weber and Ceriatone over the years and the Trinity kit by far is the most thought out and professional kit I’ve ever had the privilege to build. Everything down to the tube socket screws being able to screw into the chassis without the use of nuts and everything is just brilliant!! Again, I am not only pleased with the sound, but the craftsmanship of the parts provided. Just wanted to share my experience with building the 18 Watt TMB version.This is my first guitar amp build ever, but I have experience with pedals and various amateur radio transceivers. The instructions were top notch, and I personally feel that with just a bit of reading and maybe practicing soldering with a couple “dummy” components that even a beginner could have success with this amp. The board is very clean looking without a large ground buss hanging in the breeze, all components are top notch and very well thought out. I opened her up and the first night, despite chomping at the bit to get going, I just sat down with the box and the BOM and just made sure everything that was needed was included. Everything that should have been in there was, as well as a couple extra components for adding the V6 option later and a couple “tweaking” components. I was able to hook up and test the power supply section and everything worked well so far. I completed everything, and double checked my wiring and did the initial power up test while hooked up to a light bulb tester. All was well until I hooked up the guitar and absolutely zero signal! Frustrated, I went and checked all the voltages and they looked decently fine so I looked over my schematic and layout which I’d highlighted as I went. Not surprisingly…there was a small ground connection to the main power ground that I’d not highlighted. Two bits of advice to anyone wanting to get this kit or who just don’t know…18 Watts is still QUITE LOUD…plan accordingly. Secondly…the builders guide mentions checking all connections no fewer that 5 times, make sure you do that…and then check them once more. Even a seasoned builder of electronics can overlook something when giddy with excitement to get going. Thank you Trinity for an amazing instrument!!! Click the 'Inquire' below to receive up-to-date Canadian Dollar pricing and shipping. 18 Watt kit includes all components except tubes, speaker and cabinet.. We recommend our RS Clone set. Made by Heyboer to the exact specifications of the original Radio Spares used in early Marshall 18 watt amplifiers. Select an item using the drop down menu. Add the item to your shopping cart using the Add to Cart button.This will take you to your shopping cart. If you wish to purchase additional items, e.g. a transformer set, click Continue Shopping. This will return you to the Trinity Amps site. Select the next item you wish to purchase using the drop down menu and repeat from Step #2. When you are finished shopping, wish to check and are viewing your shopping cart, click either PayPal Check out or Check Out (Pay without a PayPal account). 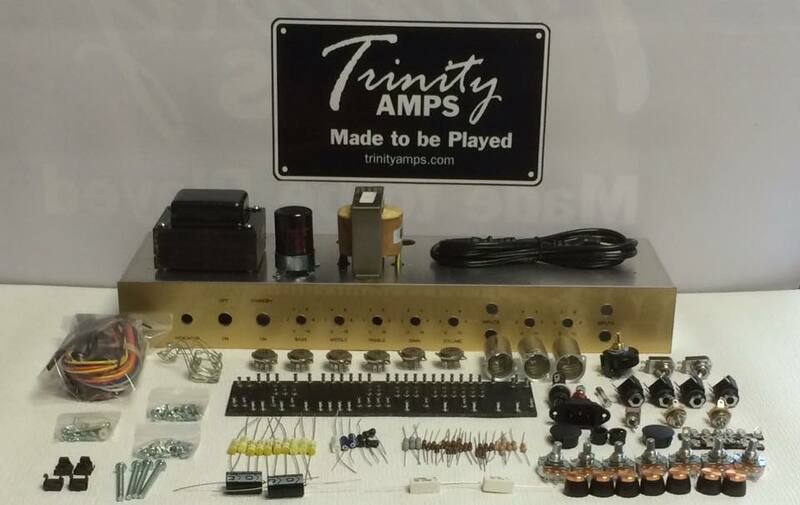 To view your shopping cart click View Cart on the Trinity Amps site and then check out using one of the aforementioned process. Be sure to include your phone number with your order. Shipping outside of North America will be adjusted and an email sent with details.